SCS (Safety Cutting System) package. Hinged, transparent electronically controlled front safety guard. Transparent safety cover on rear table. Main switch and safety lock with key. Electronically controlled, true two-hand operation. 24 volt controls (low voltage). Automatic blade return from every position. Disc brake for instant blade stop. Blade and cutting stick can be changed without removing covers. Blade changing device covers cutting edge of blade. Blade depth adjustment from outside of machine. Electric blade and clamp drive. Spindle-guided back gauge with calibrated crank. Digital display for precise back gauge positioning. UL and C UL approved. Cutting Length Behind Blade: 17"
MBM Corporation presents the Triumph 4305, 4315 and 4350 Tabletop Cutters. These durable machines have a cutting length of 17” and a cutting width of 17 1/8”. Their cutting height is a generous 1 ½”. The compact, manually operated 4305, like the other models, is equipped with a hinged transparent safety guard which is part of the industry-leading SCS Safety Cutting System. 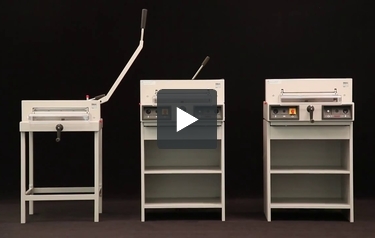 Thanks to the generous cutting height, paper stacks of up to 250 sheets can be easily cut. The hand crank is used to adjust the spindle guided back gauge quickly and easily to the desired cutting position. The perfect alignment of the paper stack is ensured with the accurate aluminum side guides and the precise measuring scale along the lateral back gauge. Fine adjustments are made using the measuring scale on the hand crank. The automatic disengage mechanism on the hand crank prevents unintentional movement of the paper once it is set. The automatic safety lock provides additional safety and peace of mind. The patented lever-activated manual planting system allows the clamping pressure to be easily adjusted for different paper qualities. The safety catch locks the blade lever in the up position until you are ready to make the cut. Our high-quality blades made from Solingen steel ensure a perfect cut every time. The 4315 semi-automatic cutter with electromechanical blade drive and patented fast-action clamp comes with a safety lock and main switch – further elements of the SCS Safety Cutting System. The exact position of the back gauge is indicated by the digital measurement display which can be viewed in inches or metric units. The bright LED optical cutting line indicates the exact location of the cut. After clamping and closing the electronically controlled safety cover, the cut is made by dual push buttons. This true two-hand operation with synchronized activator buttons further ensures ideal operational safety. The 4350 model with an automatic clamp unifies all the features described for the previous models. Its electromechanical blade and clamp drive ensure optimum workflow. Both the blade and the clamp are activated simultaneously. All three of these Triumph cutter models offer performance and safety features to meet and exceed the individual requirements of our most demanding customers. The SCS Safety Cutting System especially developed for Triumph Cutters also protects the operator while doing routine maintenance. The cutting stick can be easily removed from the side to turn or change it. The blade depth adjustment from the outside is just as easy and convenient. When replacing the blade, you don’t have to remove the machine covers. Our handy blade change device covers the cutting edge of the blade, making the blade exchange safe and easy. For more information, please check out www.mbmcorp.com. Triumph – Quality Made in Germany. The 4350 can cut up to 1.5 inches of paper at a time. This is a good cutting capacity because you'll be able to trim a couple hundreds sheets at once. It would take too long to process that many sheets with a rotary or guillotine trimmer, so this machine can help you save time. This machine can cut paper that's up to 16.875" wide. There is ample room both in front of and behind the blade so you'll be able to trim paper of different sizes, even those sheets that are 8.5" x 14" (legal-sized). The 4350 is equipped with a Safety Cutting System, a feature found in many of MBM's other cutters. The system is comprised of a number of different things including transparent safety covers on the front and back tables, a disc brake, and a safety lock. Also, this device requires two-handed operation so your hands won't be near the blade when it's in use. This trimmer has a digital display so you can see the exact position of the backgauge. This feature, along with an optical cutting line, will help you get an accurate cut every time you use this machine. The 4350 is well-constructed and has a variety of metal parts for durability. The blade is made out of Solingen steel, a very high-quality metal. Since this device is so durable, you'll be able to get a lot of use out of it. As far as a warranty goes, this device is covered for one year. Although this machine's cutting capacity is pretty good, it could be improved. For example, there are other cutters that can cut through 3 inches of paper. It would be great if the 4350 had that ability. This is a pretty big device so you may have trouble finding room for it on a work surface. Its dimensions are 27.25" (depth) x 25.25" (width) x 14.125" (height). You can purchase an optional stand or cabinet for it if you don't have enough room. Overall, the MBM Triumph 4350 is a good electric paper cutter. It has a decent cutting capacity (which could be improved a little bit) and it's capable of handling multiple sizes of paper thanks to its large table. This is one of the safest trimmers you can use thanks to the Safety Cutting System so you won't need to worry too much about getting injured. (Note: you should still exercise caution when using this machine.) Also, this product is well-built and is great for high-output environments, especially if you have the room for it. If the 4350 sounds good to you, consider adding it to your workplace today. Happy cutting! All Triumph cutter models feature high quality, German steel blades. Patented EASY CUT blade activation bars provide true two-hand operation (models 4315 and above). The optical cutting line indicator with bright LEDs ensures perfect alignment of cutting marks (models 4315 and above). A digital measurement display allows precise positioning of back gauge (models 4315–4850). Cutting Width 16 7/8" 16 7/8" 16 7/8" 18 3/4" 16 7/8" 18 5/8" 18 5/8"
Cutting Height 1 1/2" 3/4" 1 1/2" 2 3/4" 1 1/2" 3" 3"
Narrow Cut 1 3/8" 1 1/2" 1 5/16" 1 3/16" 1 3/8" 1" 1"
Behind Blade 17" 13 3/8" 17" 18" 17" 18" 18"
Front of Blade 6 1/4" 6 1/4"
Dimensions (D x W x H) 34 1/4" x 25" x 14"
42 1/2 H with cabinet) 22 1/2" x 28" x 18 1/2"
46 3/4 H with cabinet) 34 5/8" x 34 5/8" x 15 3/4"
44 H with cabinet) 35" x 39" x 23"
(50 H with stand) 34 1/4" x 25" x 14"
42 1/2 H with cabinet) 41 1/2" x 30 x 55 1/2"
(53 W with side tables) 41 1/2" x 30" x 51"
How often should the cutting stick be rotated or replaced on a model 4350? Thank you for your question. There isn't a set schedule or time frame that you have to rotate/replace the cutting stick on cutters. As they were they start to develop a groove when that groove gets too deep you will notice that the last few sheets in your stack of stock are not cutting clean, that is when you will want to rotate the stick.